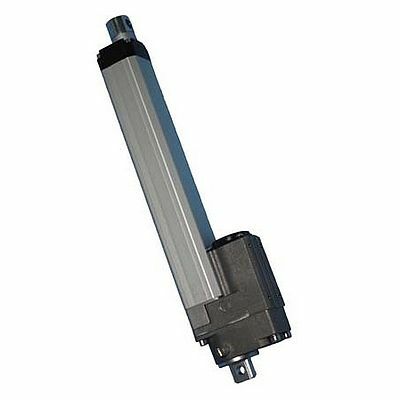 With the HG3H series Technische Antriebselemente offers a small actuator with push rod, completely covered. A trapezoidal screw with pitch 3mm provides conditionally self locking. The series is manufactured in 5 versions with different gear ratios allowing to choose between high loads or fast movements. Two fixed mechanical limit switches are integrated inside the push tube. The 24V DC motor can be controlled with an encoder with 2 ppr in 90° angle. A 6-pin connector on the motor housing for motor power and encoder allows flexible wiring. The series allows loads up to 1350N and a feed rate up to 45mm/s. The HG3H comes with a 250mm long cable with suitable connector counterpart. Mechanical connection is possible over an eyelet on the back of the actuator housing and on the push rod or in combination with cardanic pins. With these features the HG3H is a reasonably priced solution for many applications in times of automation and controlling.